What Movie Would You Like To See Turned Into A TV Series? In the last few weeks, FX has aired a series of promos for Fargo, a miniseries based on Joel and Ethan Coen’s 1996 classic. 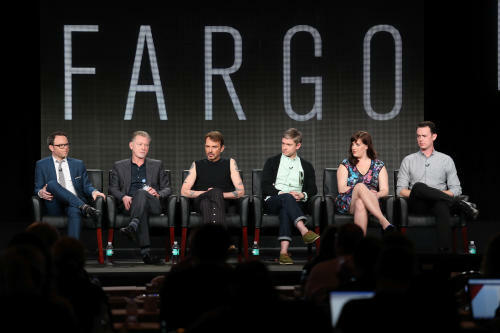 While I was initially concerned, I’ve become more hopeful on the prospects of Fargo since the series has a strong cast (which includes Martin Freeman, Bob Odenkirk, Billy Bob Thornton, and Glenn Howerton), the Coens are executive producing and will provide much influence over the show’s direction, and FX is the perfect home for the series (if it’s anything like the movie, it will fit right in next to a show like Justified). Fargo comes out on April 15th, and my anticipation has got me thinking about possible movies that could be made into a TV show or miniseries. I’d really like to see Mulholland Drive as a show to see what David Lynch’s original idea was like. And it’d be interesting if recent ensemble pictures (like A Separation or Computer Chess) were made into series. But what about you? I don’t really have one, least not that I’m currently of. But I could get behind a Mulholland Drive series. It’d be interesting to see the direction Lynch would go with Mulholland Dr. if it were a TV show. I would definitely like to see him do another series again. really good question with so many potentially horrible answers (Gladiator, Titanic…) and I can’t help but think of the catastrophic results of turning 90s classic Clueless into a show. But now that you put me in a Noir mood by mentioning Mulholland Drive, I’ll go with L.A Confidential. LA Confidential is a good choice, I haven’t even thought of that. It would work very well. I wish they could do for Harry Potter series what they’ve done with Game of Thrones. I could also see a James Bond TV show although it would probably turn out a little something like 24. A James Bond TV series would be cool to see. It’d probably take a serialized pattern. Well, which shows have actually been successful at this? MASH? So considering that, yeah, it would need to be something with a more ensemble cast like you said. But I can’t think of any at the moment. MASH is the best example of a movie turned into a TV show. It’d be interesting to see some recent ensemble pictures made into TV series, but it’d be hard to make the transition from big to small screen. What did you not like about it? It’s one of my favorite Coen brothers movies. I’d love to see Mulholland Drive as a TV show, although Lynch would need to be involved (which he probably wouldn’t be). Mulholland Dr. would be great to see on TV, but I agree that Lynch would definitely have to be involved. I wonder what it would be like if he went to a network like HBO with the project, where he would have been given more freedom than ABC. That’s a good point. Would love to see Lynch back. The Muppets. Yeah I know, but it has been 33 years since they made a new episode. It’s time for it to come back. I’d like to see The Muppets go back to television as well. Mulholland Drive, L.A confidential and more Twin Peaks! Can’t go wrong with Twin Peaks. Love Fire Walk With Me, though most people hate it. A Jack Reacher TV show could work. It would be like TV shows used to be, where the hero goes from place to place, helping people out. Jack Reacher would definitely work well as a TV show, probably much better than as a movie.